The importance of taking dental x-rays and problems that can occur from failing to take dental x-rays. Failing to take dental x-rays can lead to dental problems if they are not carried out at all or carried out too infrequently. This can lead to the need for treatment which may not have been necessary if an x-ray had been carried out. In some cases it can lead to the loss of teeth if the teeth are unable to be restored. • Show decay that is not directly visible in the mouth and will also show the size and depth of a cavity. This will assist the dentist in deciding what type of filling will need to be used for that particular tooth. • Reveal the extent of bone loss in patients who are suffering from gum disease. • Reveal abnormal growths, such as a tumour. • Determine the length of roots when carrying out a root canal treatment or extraction. • Determine whether there is enough space in the mouth for new incoming teeth. If you are a new patient, the dentist will normally take x-rays at the initial visit to be able to assess your mouth and determine whether any treatment is necessary. After this, it is considered good practice to have x-rays taken every 1-2 years. However, this may vary depending on the dental history of a patient, such as whether they have poor oral hygiene and whether they continue to get new cavities. It will also depend on the age and current condition of the patient’s mouth. It may therefore be the case that x-rays are required more frequently and your dentist should assess this based on individual circumstances. 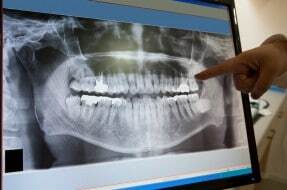 As specialist dental negligence solicitors we see many clients who have undergone extensive treatment and tooth loss which, after our investigation into their treatment, has been found to be due to dentist failing to take dental x-rays or failing to act upon x-ray results. The Dental Negligence Team secured a substantial sum for one client following the failure of his dentist to diagnose the presence of an established infection following radiographs. The man experienced unnecessary pain and suffering and would require the removal of his upper left central incisor and upper left lateral incisor teeth. He would also require bone grafting prior to the placement of two dental implants with crowns. If you feel you or a family member has suffered from a dentist failing to take x-rays which has resulted in a delayed diagnosis or increased treatment, then it is important that you seek advice from a specialist dental negligence solicitor, such as those in our Dental Negligence Team who can advise on the merits of a possible dental negligence claim.